SanOpalooza #2: Foon, Tom Tweed. 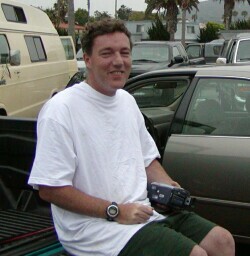 SanOpalooza #3: surfed with Craig K.
Surfed with Dan King, Ocean Beach Pier, Sept. 2000. April 2001 (WSD): Surfed with Dan King and Andy Woodard. [see beach pic] Water encounter. WSD 2001: Went to SanO after above session and met Ben Rak. Land encounter. July 2000: surfed with Tim Maddux. Water encounter. November 2001. This was a great day for me. I had emailed Dr. Blake, knowing he was coming down for the Society for Neuroscience annual meeting in SD, and I would also be attending for at least one day. Dan King also emailed me and said he was planning to meet Dave and George at Ocean Beach for the dawn patrol, which sounded great to me. Didn't see Dave or George, but they planned to meet here at 5:30, and we assumed they went elsewhere looking for better conditions. Dan and I decided to paddle out at OB. Conditions were decent with mostly shoulder high fast peeling waves. The sets were a little bigger, maybe headhigh, but they tended to close out quite badly. We both got a number of fun rides. So it was definitely a worthwhile session, even though we missed Dave and George. people (Dave, Joanne and Bill) are super high quality humans, and felt honored to be able meet, chat and surf with them. Thanks to all for a great day of alt.surfing. March 30, 2002. Steve 'the Mind" Marshall's Visit to San Diego. Planned to meet Dan King and Steve M at a spot in SD County. When I arrived, the conditions were at least as bad as forecasted. Looked very unsurfable. It sort of seemed that we would be geeting meet'n'greet points, as opposed to the "surfed with" points. Especially since I had been planning on bringing the longboard which I have never ridden, but would bring on this day knowing it is the only thing that could catch waves in these conditions. But, my wife backed out on the deal at the last minute (along with her van), so I had to bring my car, which won't fit the LB. So I brought my hybrid and a thruster, which do fit into my car. When I arrived, Dan said that Keener and SDBchGuy might show up, but the dark gray skies, and Lake Erie conditions (No offense Edmund), convinced me that they would be no shows. already suited up, and JVM was stoked to paddle, and pushing for others to join her. So Steve and I suited up and the four of us paddled out. Initially, I used the hybrid, knowing that was probably my only chance at catching one of the death-defying ankle slappers. I caught my requisite 3 waves fairly quickly, and rode them very poorly. At this point, I figured I'd better give Steve a chance to catch a wave so I traded boards with him, and tried to catch something with the thruster, to no avail. After everyone exited the water, we decided to head to Joanne's. Had some refreshments, surf videos, and talked story, or Bill talked story and we listened. Thanks Joanne (and your hubbie) for the great AS hospitality! And Thank you to Bill, Tom, Terry, Dan and Steve for showing up in such unrewarding surf conditions. (see pic of the gang). Bodysurfing with Sully (Aug 2002). No eye rolling here. Although I haven't bodysurfed in almost twenty years, I have some very fond memories of bodysurfing in Newport as a teenager, so I was pretty stoked to give it a try again. I had surfed earlier in the morning on my shortboard at a spot a little further north, but conditions were, at best, marginal for this type of wave riding. But body surfing those small waves were a blast. I will definitely keep the fins in my car for when conditions are too small for my board. It was great to finally meet up with Mike, I had been planning for the last three years to meet him for some water time during his Newport visits, but every year circumstances had conspired against such a meeting. It looked like that might happen again this year, as I needed to get to Cleveland (OH) due to family emergencies. But my flight was out on Monday morning, leaving a Sunday morning DP open. Ohio AS Surf Visit with Edmund (Aug 15, 2002). Although I was hoping to get some water time in on Lake Erie, I realized that the short duration of my trip, and many other things to do while I was there would make it unlikely that I would get my first experience in surfing fresh water. This turned out to be the case, but I did get a chance to get down to Kent and visit Edmund. We had planned on meeting about 8 or 9 pm on Thursday night for a beer. I figured I would hang out for an hour or so, since Edmund had to get to work the following morning. It was great meeting him and we ended up shooting the sh#$ until about 1 am. I sincerely apologize for keeping you (Edmund) out so late, making your day at work the next day difficult at best. I also appreciate the great hospitality shown to me by Edmund. He is definitely a high quality human, just like Mr. Sullivan.